Improving cattle handling skills can improve animal performance, quality of life and animal welfare. MANHATTAN, Kan. (May 20, 2010) — “Actually, I don’t teach animal welfare. I talk about cattle handling,” explained Texas AgriLife Extension Specialist Ron Gill, speaking before the International Symposium on Beef Cattle Welfare at Kansas State University in Manhattan, Kan. The only way to work cattle quickly is slowly, Texas AgriLife Extension Specialist Ron Gill says. Gill said complacency and confidence in tradition make animal welfare, by itself, a hard sell among most industry segments. Many producers don’t view it as a real problem. However, Gill said, producers can accept how low-stress cattle handling methods can improve animal performance, decrease incidence of sickness and injury, and lower production costs. Gill said animal anxiety and stress is low or non-existent when cattle want to go where the handler wants them to go. That’s the message shared with producers, livestock market employees, veterinary students and others during stockmanship training sessions conducted in cooperation with the National Cattlemen’s Beef Association. The challenge for many people, and especially some veteran cattlemen, is to break old habits. 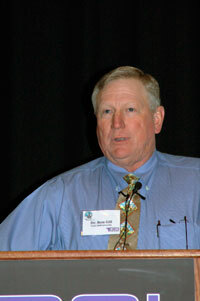 Gill urges cattle handlers to slow down. Ultimately the job will get done faster. Instead of working cattle from behind, he advises handlers to work from the front or side of the cattle to draw them toward the desired direction. Pressure to make cattle move should be applied from the side, at an angle, and pressure should be released as a reward for cattle movement. The key, Gill explained, is the position of the handler and how pressure is applied and released to control cattle movement, their speed and their direction. The industry, Gill added, needs to improve livestock handling methods to eliminate the ram-and-jam mentality and use what we know about animal behavior to make cattle handle more easily and more quickly.